The Unfinished City's lost viewing platform. I have walked by this memorial, to the Duke of York, countless times and assumed that it was a simple memorial atop a column. However, I was always intrigued by the doorway at the foot of the column, wondering why it was there and where it led. Was it to access an underground tunnel or was it simply a later addition, to act as a kind of cupboard? I needed to find out. This column, designed by Benjamin Dean Wyatt, was completed in 1832, with the statue, by Sir Richard Westmacott, being placed on top in 1834. 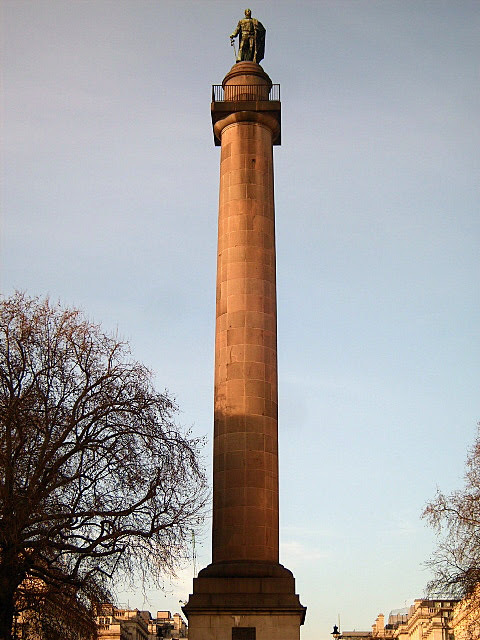 The column hides a spiral, stone staircase, consisting of 168 steps, which allowed visitors, for the cost of a shilling, access to a viewing platform. Acting as a twin to The Monument in the City of London, this viewing platform offered views of a London that many people rarely got to see from, in that day and age. In around 1880 the viewing platform was closed to the public and the heavy wooden doors, at the bottom, have rarely been opened since. A structural survey of the interior was carried out in 2006, but there are no plans to open it back up to the public. I feel that this is a great shame, as the views would give a unique perspective of this enchanting area.